One of the elements I enjoy is coaching salespeople and sales managers. In this role, I get to see up close what makes people tick. I’m always surprised when people ask me why they aren’t able to attract the really great clients. 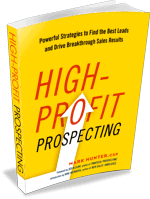 My response always begins with the need for the salesperson to first look at themselves. I share this with people I’m coaching, and I follow it up with this simple question: “Do you have customers that after they’ve bought from you become dissatisfied by what they received?” The answer is almost always “yes,” and I’ll say that stems from the sales process and not being clear on expectations. Prospecting with integrity means not allowing the customer to develop false perceptions, even if it means you can’t close the sale as quickly. In the quest to close a sale, many salespeople will make a statement or claim that is going to be hard to back up down the road. The same goes for prospecting. I see salespeople put time and effort into developing leads that simply are not a good match for the product or service they sell. It’s too easy to fall into this prospecting trap, because of the belief you don’t have enough prospects or these marginal ones are the best you’ll ever get. Integrity begins with you. It’s not something you can see, touch or feel, but you know integrity when you experience it. Integrity is the foundation from which trust is built. High-quality customers always seek out trust. Low-quality customers will always seek price. It’s a pretty simple realization — when you sell with integrity, you will attract trust-driven customers who will be far more outcome driven than one who is focused on price.